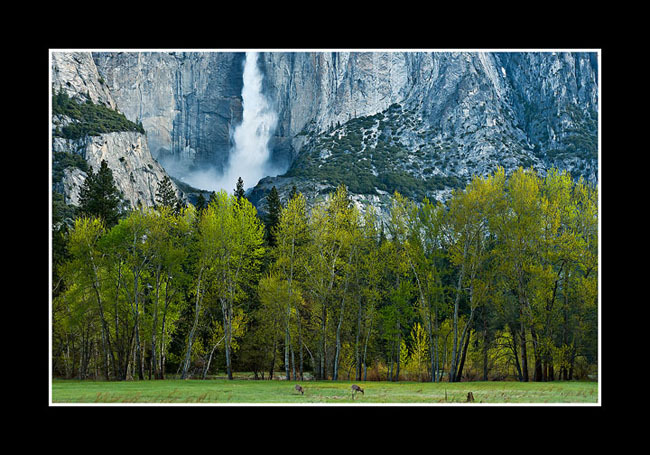 A spring or summer day trip by car through Yosemite Valley most likely will not produce solitude. If you have ever been to a national park, you know this is not difficult to figure out. My first trip there was no exception, I knew this was coming….the hordes of people and vehicles. While certainly distracting, it doesn’t completely taint the incredible beauty of this world-class place. Honestly, this kind of overzealous commercial development in our parks does have its perks. For instance, in Yosemite Valley you have your choice of numerous places to eat or stay or go shopping. The restaurants have cable television, which is great is you are trying to catch a sporting event. Additionally, Yosemite NP is the only park I know that has what is basically a full-sized grocery store, complete with its own liquor section. It is actually pretty amazing and sometimes very convenient. It is called “Paradise” and it was captured in the early morning quiet hours in Yosemite Valley by California photographer Chris Chamberlain. I didn’t ask Chris exactly where he composed this image, but my guess is it wasn’t too far from the road. For me, this photograph serves as a melancholy reminder of the incredible beauty of this sensitive area and how imperative it is for our government to manage it properly for the people. This leads me back to my initial question: what would John Muir think about Yosemite now? To answer this, it is necessary to provide some background about a part of Yosemite NP that John Muir was immensely fond of. For those who don’t know, there is a less visited, often overlooked little slice of paradise in the northwestern section of the park called Hetch Hetchy. Muir absolutely loved it there. During Muir’s lifetime , this area was very similar to Yosemite Valley and rivaled its sheer beauty. All of that changed in 1923 when it officially became a reservoir providing the city of San Francisco with 85% of its drinking water – even to this day. The birth of the reservoir started 10 years earlier when then President Woodrow Wilson approved the plans to dam Hetch Hetchy. The story goes that Muir fought bitterly against this proposal. His inability to stop it eventually broke his heart and led to his death in 1914. With this mind, I often find myself wondering if John Muir could have seen 100 years into the future, which valley would he have preferred? The one full of commericial development, traffic, and people with all its amazing natural features. Or the valley submerged under water, retaining only part of its beauty, but much less visited. To me, it’s an interesting question and certainly one to ponder. What do you think? I would love to hear your opinions. We’ll continue this topic in my next post. Have a wonderful weekend! Anyone who has ever visited Yosemite Valley in Yosemite National Park knows how crowded and potentially dangerous it can be during peak tourism season. Today I am starting a series of essays chronicling my personal experiences in Yosemite National Park as they relate to the iconic naturalist and conservationist, John Muir. Most of you probably are cognizant of who Muir was and what he represented, and you probably already know that he was literally the person responsible for putting this classic park on the map. Often times I wonder what he would think about Yosemite in its current state; a place much different from the one he knew and loved. This especially pertains to Yosemite Valley, the thoroughfare and commercial hub of the park, and for that matter, just about any park. After recently viewing a fine art photograph of the area, I was inspired to begin these essays, which are for everyone, whether you’ve been there once, never visited, or know it like the back of your hand. Most visitors to Yosemite enter either through the South or West entrances. Both can be accessed from the California city of Fresno. Both entrances are fairly similar in scenery and length…In terms of this essay, either one of these entrances could apply. For many, the City of Fresno represents the gateway to Yosemite National Park. Unfortunately, you normally can’t see the mountains from there because the area is so hazy. I imagine it’s probably a combination of the pesticides and chemicals used on the farms in the area along with the California smog that seems to permeate everywhere. The journey to the park begins here, past the fruit and vegetable stands of the rural surroundings. Eventually the city gives way to the Sierra’s rolling foothills. Slowly, subtly, and steadily you begin to climb, passing small towns along the way. The trees get bigger and the road gets steeper as you venture further into the mountains. Soon, you are in a full-fledged, unmistakable mountain forest with rushing streams and larger than life-sized trees. After several more miles of driving you round another blind, sharp turn and out of the corner of your eye you catch the glistening highlight of a whitewater of gushing steam. What the heck..you think…its worth a couple of minutes of your time and pull off to check it out. Immediately it’s the sound that catches your attention. This stream is no joke. As a matter of fact, its more like a rushing torrent and upon closer inspection, you realize that one false slip into that and its certain death. You also realize that the stop was well worth your time. As you continue up the mountain your natural appetite for scenery magnifies as the journey continues. After a short time, you reach the park entrance, a nondescript area in the forest where they take your money, give you a brochure, and let you in. The idyllic drive continues and you eventually you start to descend weaving your way down the mountain towards the valley below. Soon you begin to catch glimpses of what you’ve been longing for all along. As you continue your descent, the views get better and better. It is now onto the valley and its record-breaking spectacles of nature. All at once, the traffic picks up significantly. You notice this curiosity immediately at your first stop, the elegant Bridalveil Falls. Here the whipping, free-flowing, waters of Yosemite Creek gracefully plunge over 600 feet to the valley floor, making it one of the largest waterfalls in the park. The mist is everywhere and the rainbow it creates is a pleasant, natural surprise. The sound is unmistakable, like an oversized snake hissing and beckoning in the distance. Never mind the scenery though, it’s the traffic that gets your attention first. The parking lot is packed with people running around as busy as bees. Meanwhile there are vehicles coming and going, pulling out, pulling in, backing up, turning and parking. This all reminds you of some sort of strange mating ritual of man and machine here on the concrete and black top, with a gargantuan waterfall as a backdrop. They act like they are the only ones there. Oblivious to any kind of danger, they walk out in front of moving vehicles while shouting and yelling to their friends and family. Suddenly, you find yourself making a hasty exit from the oversized parking lot of craziness thinking you’ll catch the next one instead. Just so you know, there won’t be any pictures on this post as I don’t like to shoot four-wheel tracks. This is a spontaneous blog as I wanted to write about Utah’s crown jewel today, but I changed the topic while doing research on my top 10 parks for summer travel series while coming across this newspaper article. Instead, we are discussing a particular state park located just outside of the eastern entrance to Zion National Park near Kanab called the Coral Pink Sand Dunes State Park. I’ve been fortunate to visit dunes like the Mesquite Flats in Death Valley National Park as well as the Kelso Dunes in the Mohave Desert National Preserve , and let me tell you the coral pink dunes are every bit as scenic and grand as those. These dunes are extremely impressive. Honestly, they don’t really look pink until about ten minutes before sunset, but there are some spectacular trees, plants, and flowers, amongst the large, rolling dunes with excellent distant views to boot. This is one cool place. Unfortunately, there is one large non-geological difference between these dunes and the aforementioned ones in California. It has to do with rules and regulations… yep, you guessed it at the Coral Pink Sand Dunes ATVs and their drivers scurry across the sand like ants on ant hill. Here is my issue with this: I believe the state is allowing a relatively small group of individuals to basically ruin the experience for most other people. (And I am not even talking about the environmental and physical impact and consequences these machines have on the land) At the Coral Pink Sand Dunes, it’s not just a small, designated area for the ATV riders to enjoy; it is pretty much the whole darn park, including its highest and most scenic dunes. Can you believe it? Clad in helmets and racing suits they zoom up the sides of the dunes like skateboarders on a half-pipe. For an avid nature lover, experiencing this is very annoying and frustrating; you can forget about doing any hiking in the park because you’ll most likely get run over and killed. What’s even worse is the noise pollution, so not only can you not do any exploring, one can’t even sit back and peacefully enjoy the views because there is so much unsettling noise. Before I went to the Coral Pink Sand Dunes, I thought areas like this were for natural relaxation to get away from the hustle and bustle of city life and technology; not listening to what sounds like a high-pitched lawn mower screech across the desert. Now that I think about it, while they are at it, why don’t they just set up a shooting range there and let all the gun-toting enthusiasts come in and blast things up too. On the flip side, there is one group in particular that I feel especially bad for, who I think get the real short end of the stick here. If you have ever been to a national park in Utah then you’ve probably seen lots of these folks. Its out international friends from Germany and other countries that predominately come to these places. Seriously, these people are paying a lot of money to come to this country specifically to visit these out-of-the-way places. Small town, locally owned businesses around these parks absolutely depend on these types of tourists for their existence. My guess is anywhere between 40 – 60% of park visitors at any point in time in Utah are from a countries other than the United States. Now, I know these people aren’t towing ATVs over from Europe and my unsubstantiated hunch is they probably aren’t renting them much either. I just can’t image the aggravation of traveling (that’s flying and driving) literally thousands of miles to come a place to enjoy its natural beauty – only to have it ruined by the rules and regulations of that country’s or state’s government. Were not talking about a 3rd or 4th world nation here, but the good ol’ US of A. The country who invented the idea of a national park. This again leads me to my point for the Coral Pink Sand Dunes State Park – why bite the hand that feeds you? Why give so much power and authority to the ATV users? Well, anyone who has spent some time in the area will notice what a huge marketing ploy ATV use and rentals really are. My guess is the consumer market for this brand of entertainment is a totally different type of person. It’s unfortunate because it appears that ATV riding is extremely popular. Now I am wondering how long before the government takes this to the next level and allows them in national parks too. Now, that’s a scary thought! In conclusion, trying to allow ATV users and photographers/hikers to simultaneously enjoy the same tract of publicly owned land just doesn’t blend – is like mixing oil and water and it is unfortunate at the Coral Pink Sand Dunes my group is on the wrong side of the equation.